Click on that picture to see a bunch more. Kit’s shrug didn’t make it in time. It did get done, but not for Easter. She was very sad. And cold. Not really. Here she is modeling her shrug later. 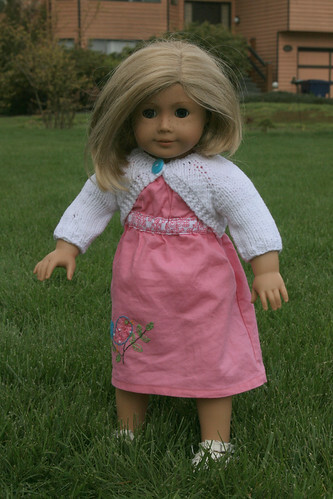 Aren’t you impressed that I got an American Girl doll to stand in the grass by herself? I was. Calvin was watching and laughed hysterically every time she fell over. I also didn’t get any hair things done for the girls, and both of the men’s ties didn’t get made either. Oh well. 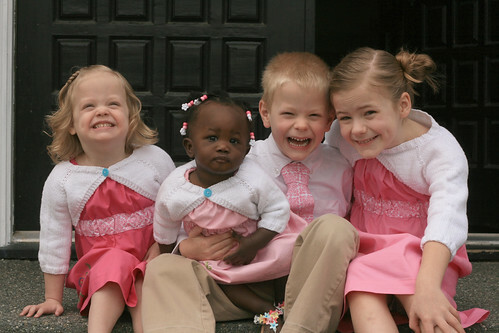 Who cares about things like that when this is your pack of kids?! ?